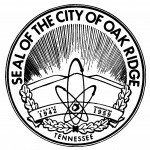 There are lots of candidate forums and “meet the candidates” occasions scheduled this year for Oak Ridge City Council and Board of Education elections. All are open to the public, without charge. Wednesday, October 1 – PTA/PTO candidate forum for school board, 6:00 pm at Oak Ridge High School amphitheater. Meet and greet starts at 5:30 pm. 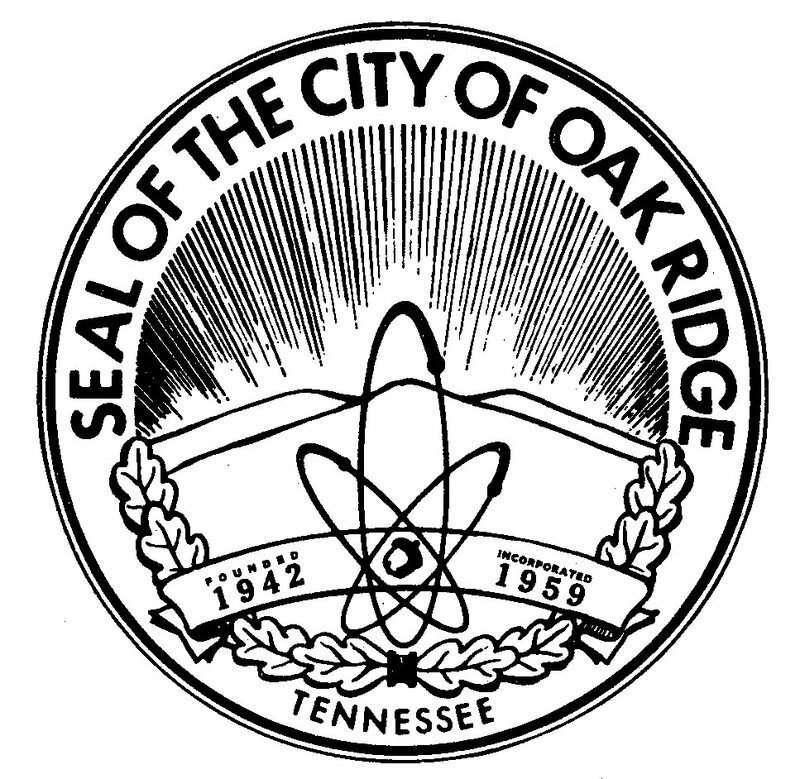 Wednesday, October 8 – PTA/PTO candidate forum for city council, 6:00 pm at Oak Ridge High School amphitheater. Meet and greet starts at 5:30 pm. Tuesday, October 7, 7 pm, at Pollard Auditorium. Early voting starts Wednesday, October 15, and runs through Thursday, October 30. Election day is Tuesday, November 4. Updated October 12 after I discovered that the Elks Lodge is holding two candidate forums. One of the thorniest issues that City Council faced in my 5+ years is back. On Monday, Council decides whether to renew the contract with Redflex (possibly in new form), whether to cancel it, and (with or without cameras) whether to ask the state to let the city install a pedestrian-crossing stoplight in front of Oak Ridge High School (instead of continuing existing safety measures like crossing guards and traffic cameras — and to be paid for with traffic camera revenue). It’s my impression that the majority of Oak Ridgers support the traffic cameras for their positive impact on traffic safety (something that can’t be proven from the available accident statistics, mostly because we don’t have enough accidents to make statistically significant comparisons). Back in 2008, I voted for the city ordinance that allows the use of traffic cameras in Oak Ridge. However, I voted against the contract with Redflex, largely because the plan to use cameras seemed to be more about cameras than about achieving safety goals — it wasn’t connected to engineering analysis or a program of alternative (non-enforcement) methods for improving driver behavior (such as better signs and traffic calming). Now the city has a chance to re-evaluate the program and improve it for the future. What should Council vote to do now? Stop operating some cameras as “speed traps.” The biggest thing I learned from the camera data recently shared with Council and the public (finally, after nearly 5 years of camera operation and many requests) is that there is a solid factual basis for the complaints that I received as a Council member (mostly from out-of-towners) who claimed Oak Ridge was running a speed trap. Redflex data show that about 1.4% of the vehicles passing through a camera-equipped school zone during school-speed-limit hours get tickets, on average. For westbound traffic passing the high school, that goes up to 2.1% (about 1 in every 50 vehicles), and for westbound traffic on Robertsville Road passing Willowbrook School, it’s a whopping 3.9% (about 1 in every 25 vehicles). Those are the kinds of violation rates that people associate with speed traps. Almost one-quarter of the camera tickets issued are for school-zone speeding — the camera operations that function like speed traps. When one person in 25 or one person in 50 is breaking the speed limit and getting ticketed, and this happens day in and day out, I think it says that the speed limit might be unreasonable — or the city needs to be trying other methods to promote safety. I don’t know if this means reducing the number of tickets by reducing the duration of school speed limits (I’ve talked to quite a few people whose camera tickets came when no children were present — for example, 2o minutes after school started) or upping the enforcement threshold (from 6 miles over to 10 miles over, for example), or if it means something like adding more flashing lights in school zones to remind drivers that children are present. Add a pedestrian crossing light in front of the high school — thus eliminating or reducing the need for crossing guards, traffic cameras, and/or the school-zone speed limit. A pedestrian light is a feasible and affordable way to resolve the longstanding problem of kids crossing Oak Ridge Turnpike at that location — and it seems to me that a pedestrian light could eliminate the need for those other measures (after a phase-in period for people to get used to the new arrangements). I asked for this for several years (ever since city staff outlined a plan for it), and I was disappointed when city staff shelved the idea (largely because of national guidelines that said school speed zones and crossing guards are the preferred means for protecting school kids). Council should support this now. 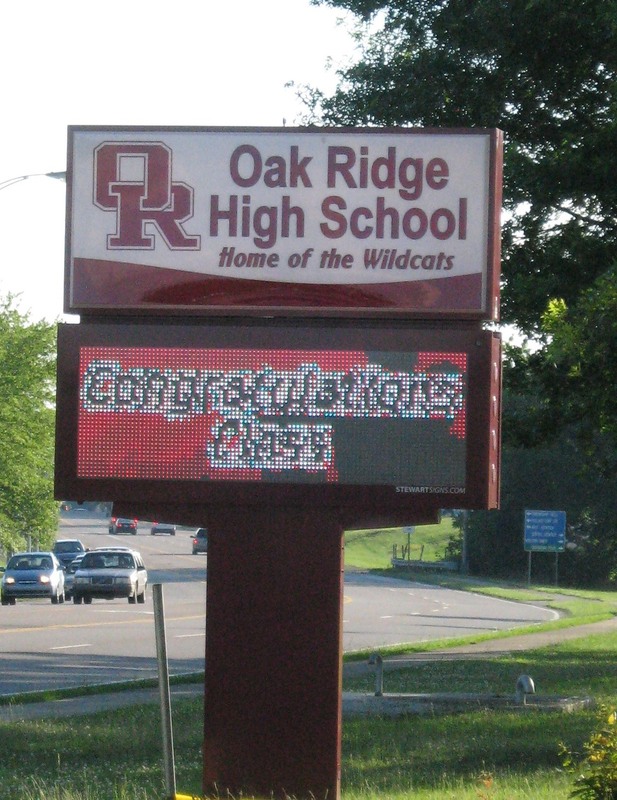 Traveling around Oak Ridge, I’ve been seeing two disconcerting trends related to signage, one temporary (“signs too soon”) and one more permanent (“signs too flashy”). 2. No sign shall have blinking, flashing, or fluttering lights or other illuminating device, which has a changing light intensity, brightness or color. Flashing signs or signs that contain reflective materials, which present a hazard or danger to traffic or the general public. For school facilities with a student population greater than one thousand (1,000), one (1) indirectly or directly illuminated or non-illuminated pole sign shall be allowed. The pole sign may be either a changeable copy sign (readerboard) or a moving copy sign. The surface display area of the pole sign shall not exceed sixty (60) square feet. The top of the pole sign shall be no higher than fifteen (15) feet from ground level. Code enforcement departments seem to have written off sign regulations, as evidenced by the growing proliferation of animated and flashing signs in communities that otherwise prohibit or strictly regulate them. Are the days of static signs and commercial corridors that don’t resemble the Vegas Strip over? Are sign code issues passe among planners? Several people have complained to me about the flashing signs I mention. I don’t hear much objection to those electronic signs that display a changing informational message, such as the text signs at IHOP and the CVS Pharmacy. However, people are bothered by animations and other rapid changes in lighted signs, regardless of whether the image is of a waving American flag, the company’s logo, fireworks, or this week’s special prices. The aesthetics of the resemblance to the Las Vegas Strip are one concern, but there are safety issues, too. It is particularly troubling when those flashing images are in a driver’s line of sight, as they can distract drivers from watching the road. Considering the negative responses some people have to these signs, I can imagine that flashing signs could “turn off” some prospective customers — the opposite of the result the businesses are hoping for. Obviously, I haven’t yet heard from a cross-section of the community on this, but it’s my hunch that many of us would be much happier if local businesses would stop using all the fancy capabilities of their electronic signs. That is, treat them as electronic message boards, with static messages that change no more frequently than once every 10 seconds or so — and no dramatic changes in brightness, color, etc. Update, June 13, 2010: Hurray for Oak Ridge High School! A few days ago, the animation came off their electronic sign. The last time I looked, it was displaying time and temperature, plus a “Welcome Class of 1960 – 50th Reunion” message. I believe that’s the kind of informational message the community was expecting when the sign was approved.